The temps are dropping a bit and I'm thinking about my fall look. It has to be playground appropriate but still look pulled together. I don't want to look like Dowdy McHousefrau at the park play cafe and I want to be able to transition well to a night out look. In my world, I also require easy pieces I can throw on and be ready to hit the streets in 5 minutes or less. These trends from Old Navy's fall line would definitely fit the bill. The rockstar jeans and cords come in many colors from neutrals to brights. While I'm drawn to the brights like the plum, I think I need to add some neutrals into the mix so I can get away with wearing them more than once before washing. Am I the only mama who does this? Of course, I have animal prints but I don't have a leopard print sweater dress / tunic! I probably wouldn't wear it like the model as my knee caps would fall off in Chicago fall. I'm more likely to pair it with tights, leggings, or skinny jeans. Maybe a skinny belt and a chunky heeled platform for night time. A plaid shirt goes well with jeans (can you see it with the plum Rockstar jeans?) but I also think it would look great with a pencil skirt -- preferably sequined. I happen to be really drawn to the yellow color. It can fill in as my ray of sunshine for the overcast days ahead. The motorcyle jacket is classic and is always on trend. This jacket comes in black and brown but I think grey is the perfect color to go with everything which is key for the mom uniform. Very necessary for an extra layer of warmth. Again, Chicago fall. Why not just call it winter? This boot will match everything too. I would especially love to see them paired with the skinnies. I can already see myself going to the movies in them. What trends will you be rocking this fall? Will you be shopping at Old Navy? In related news: Check out Old Navy at Bryant Park debuting their fall fashions with models of every size. The Rockstar jean really does look great on everyone! Old Navy Presents: The Fit for Fall Fashion Show for All I was selected for this opportunity as a member of Clever Girls Collective, and the content and opinions expressed here are all my own. 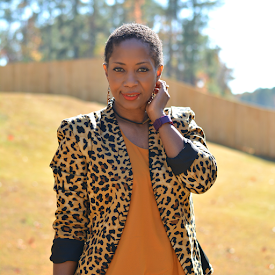 Ohh The leopard dress and the jacket are calling my name! Cute, I need that leopard dress in my closet! I actually just spotted one similar in Marshalls. As much as I love the Rock Star Skinnies on people and I love the way they look I still haven't been able to find my size and fit. They just don't work for me. I need those boots in my life!!! And I've been wanting more animal print stuff and that dress is so cute! Old Navy has boots!?? Who knew! Me, you , and That's My Mama will be triplets! Boo...I know I will probably have to doctor a pair myself as I have short leg. Me too!! I'm going to look for them in store this weekend. Yep. They have other styles too. I saw cowboy boots and wedges on the website. I LOVE their color pants! Old Navy has really upped their game this year! I am an Old Navy addict. I will certainly be picking up a few items from like the printed cardis to rock for fall. I think so too. I've always been a fan of their jeans though.